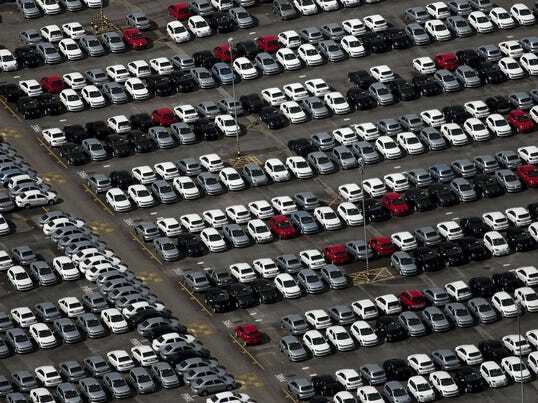 US auto sales crushed expectations in May, with sales rising to a seasonally adjusted annualized rate of 17.79 million units, according to Autodata. Economists expected sales would come in at a pace of 17.3 million. Throughout the day, we saw major automakers including General Motors, Fiat Chrysler, Ford, Toyota, Honda, and Nissan all report sales that beat expectations. Honda reported an unexpected sales increase in May, with sales rising 1.3% against expectations for a 4.4% decline. Toyota reported its US auto sales fell 0.3%, less than the 1.8% decline that was expected. General Motors reported sales that beat expectations in May, with sales rising 3% against expectations for a 0.1% increase. Fiat Chrysler kicked off the reporting, with sales rising 4% in May, topping expectations for a 2.6% increase. Ford later followed up with a 1.3% sales decline in May, which is less than the 3.1% declined that was expected. Nissan also saw sales beat expectations, with sales fall 0.8% against expectations for a 2.4% decline. Economists expect that auto sales rebounded in May to a seasonally adjusted annualized rate of 17.2 million vehicles after April’s results disappointed. In April, sales totaled a pace of 16.5 million.